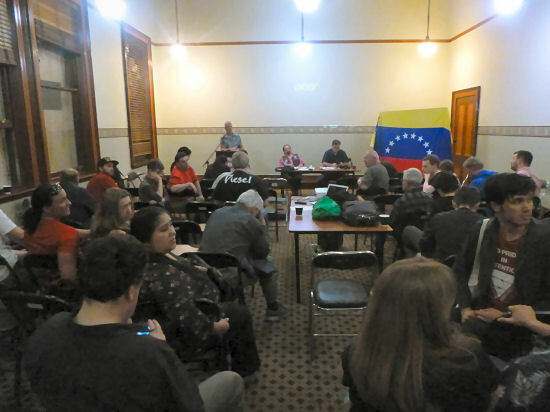 At a packed meeting at the Melbourne Trades Hall, on the night of Wednesday 20 February, Victorians heard the Venezuelan consul, Daniel Gasparini, refute the corporate media narrative against the government of Nicolas Maduro, the elected President of Venezuela. This corporate narrative includes claims that President Nicolas Maduro is a corrupt and incompetent, that his socialist policies have brought on economic ruin and that the overwhelming majority of Venezuelan people are opposed to him. Nicolas Maduro was only able to win the last Presidential election it had been rigged in his favour. Against all international law, Juan Guiado, whom 85% of Venezuelans had never heard of, suddenly announced on 23 January that he was now interim President of Venezuela and that Nicolas Maduro was no longer the elected President. He was clearly taking his orders from U.S. Vice President Mike Pence, with whom he had spoken the previous day. Daniel Gasparini also explained how, as with the United States coup in Chile of 11 September 1973, the U.S. is now doing its utmost, principally with sanctions, to make life very hard for ordinary Venezuelans. In doing so, it hopes that many will blame the government or else see the overthrow of that government as the only way to end the hardship and social disruption. Clearly the United States has failed in this goal. Against Juan Guaido's explicit and repeated requests for an invasion by the United States, 86% of Venezuelans oppose this invasion. In spite of all the bullying and threats, most recently by United States President Trump against Venezuelan soldiers they remain resolved to defend their national borders, even against U.S. operated trucks attempting to carry supposed humanitarian aid - with who knows what else - across the border. Donald Trump's hopes to remove from power a government resolved to serve the people of Venezuela, rather than U.S. corporate interests, without direct military intervention, has clearly failed. Direct military invasion would be necessary to remove Maduro and would result in world wide condemnation of the United States and its vassals, including Australian Prime Minister Morrison. Should it ever come to that, then we must do what we can to make this voice of just protest as loud as possible. Certainly at the Federal elections, all candidates seeking our vote, Liberal, Labor, Greens, Independents, should be held to account for their support for United States aggression or their silence. The Presidential election was conducted amidst a vicious campaign against that election by hostile foreign powers and their local agents, which includes much of the Venezuelan corporate newsmedia. 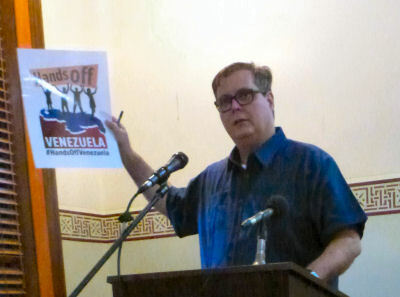 That campaign tried to persuade Venezuelans to boycott the election. They urged this boycott in spite of the fact that the election was being properly overseen by reputable international observers. Clearly Guaido and others who wanted to flog off Venezuela's PDVSA oil company to foreign corporations, knew they could not possibly win at the ballot box, so they chose a boycott as their the next best option. Given that only 46.01% of Venezuelans voted in that election they were somewhat successful in this. One thing that every late-stage ruling clas has in common is high tolerance for mediocrity. Standards decline, the edges fray, but nobody in charge seems to notice. They're happy in their sinecures and getting richer. In a culture like this, there's no penalty for being wrong. The talentless prosper, rising inexorably toward positions of greater power, and breaking things along the way. It happened to the Ottoman empire. Max Booy is living proff that it's happening in America.